The job of reviewing and approving expense claims belongs to the Treasurer unless the claim involved was submitted by the Treasurer. When local members submit expense claims a record of the form appears on their Personal Expense Claims screen and on the Local Admin/Expenses screen. Here you see the listing of submitted expense on the Local Admin/Expenses screen. Note the submitted status. Also note the presence of Show entries, sorting options, and Filter. If there is a long list and you are reviewing claims, you may want to filter by submitted to clear the display of everything except the claims needing your attention. Submitted forms need to be reviewed and the Local Executive is responsible for ensuring the form has been correctly completed. To view the claim, click the Details (the Up Arrow) button that appears beside the claim number. This opens the expense claim form. Carefully check the data as it is presented to you and determine if the claim should be Approved or Rejected. If hotel expenses are claimed for more than one day, the system automatically splits the amount into a daily charge. On the finalized version of the claim you see the daily charge, not the total entered in edit mode. 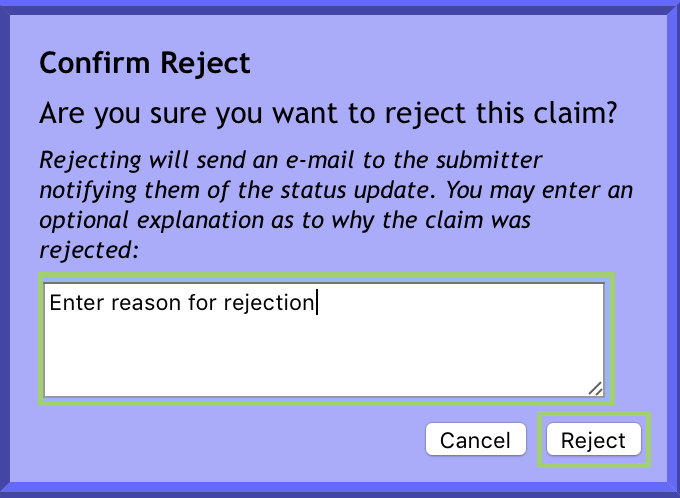 If an error is found, click the Reject button. A verification window appears enter an explanation to share with the member making the claim then, click Reject. Back at the Pending & Approved Expense Claims section you will now see the claim as Rejected. 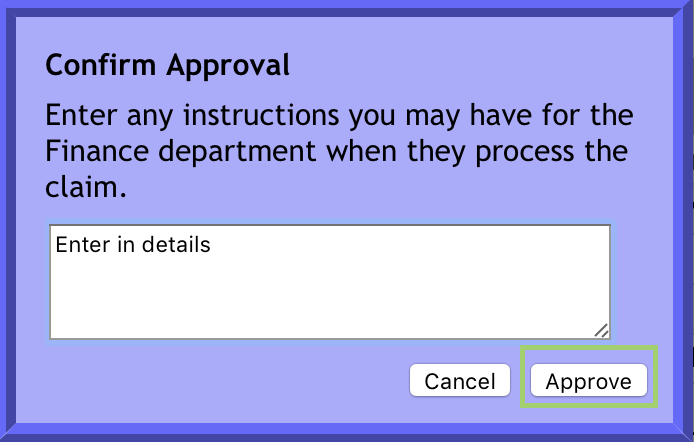 If you Approve the Expense Claim they you will have a confirmation screen appear. Enter notes if required and click Approve. Back at the Pending & Approved Expense Claims section, you will now see the claim as Approved. Note that when approved no email message is sent. Instead, the form is now accessible to UNA Centralized Accounting. Since the expense claim form is to be paid by the Local and handled by Centralized Accounting, the only anticipated problem would be relative to TD1 Without a TD1 on file, no direct deposit can be made on any claim involving salary payments. The status of the Expense Claim form will reflect you have approved it – visible to the person submitting the claim when they access their own Expense Claim screen. Again, this page needs to refresh to display the status change. Since your detailed view appears in a separate window, once you have completed reviewing one expense claim, close the window used to display it. You are able to move to the next submitted form. Note that you may now have several claims showing a status of Rejected. You just is complete until the status again show submitted. This status indicated that the person submitting the claim has edited and resubmitted the claim for you review. If you want to verify your work and you know hat you have completed your review of expense claims, you can refresh the page. Any claims that are Provincially or District funded are handled immediately by UNA Provincial Accounting. They do not require any review by the Local Executive. Instead, UNA staff will do the review and complete a similar Reject/Approve process. Any claim that still shows the Pencil button is still available for modifying if needed.